For almost ten years following 9/11, Osama Bin Laden evaded capture. 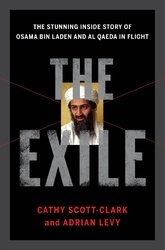 The Exile tells the inside story of that decade through the eyes of those who witnessed it: bin Laden's four wives and many children, his military and spiritual advisors, the CIA, Pakistan's ISI, and others who have never before told their stories. Award-winning journalists Cathy Scott-Clark and Adrian Levy recount in gripping detail the flight of Al Qaeda, the formation of ISIS by bin Laden's lieutenants, and bin Laden's rising paranoia and eroding control over his organization. We know little about what happened at Abbottabad on May 2, 2011, and we know even less about the wilderness years that led to that fateful day. This landmark work fills in those crucial gaps. Cathy Scott-Clark and Adrian Levy are acclaimed investigative journalists, and the authors of several books, including The Siege: 58 Hours Inside the Taj Hotel. In 2009 the One World Trust named them British Journalists of the Year, and they won Foreign Correspondents of the Year in 2004.